How is YTD Performance review is calculated in Share market? 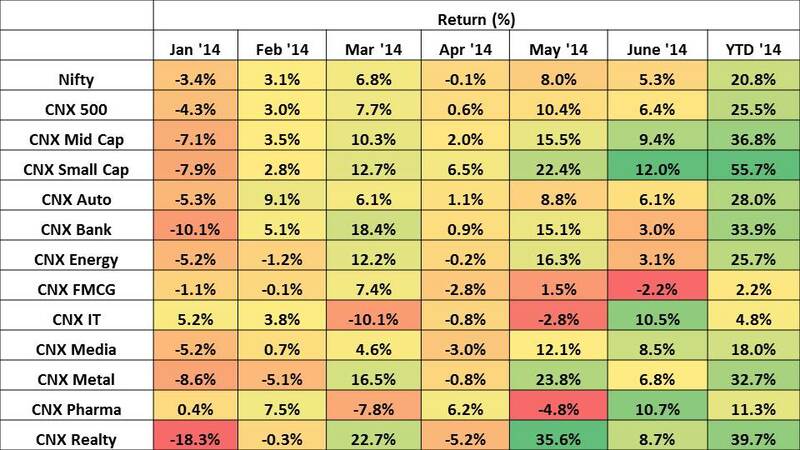 The Indian equity market continued its positive run with Nifty scaling up another 5.3% in June’14. 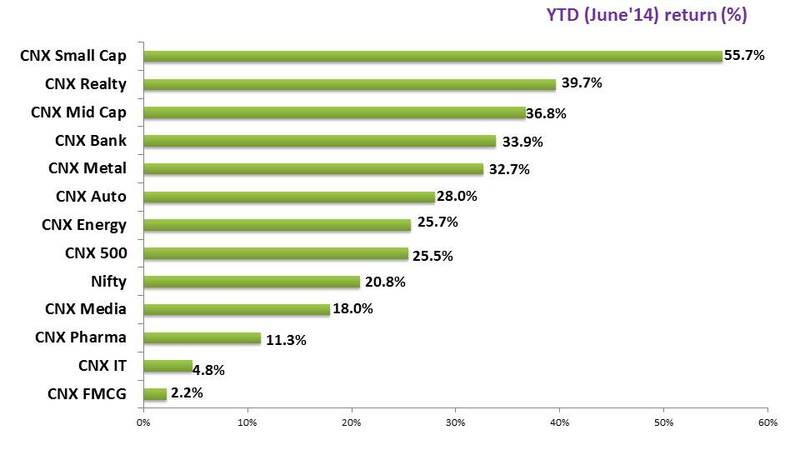 Small cap stocks were once again outperformer of the month with CNX Small cap index up by 12%. In terms of sectors, Pharma and IT sector made a good comeback posting gain of 10.7% and 10.5%, respectively. 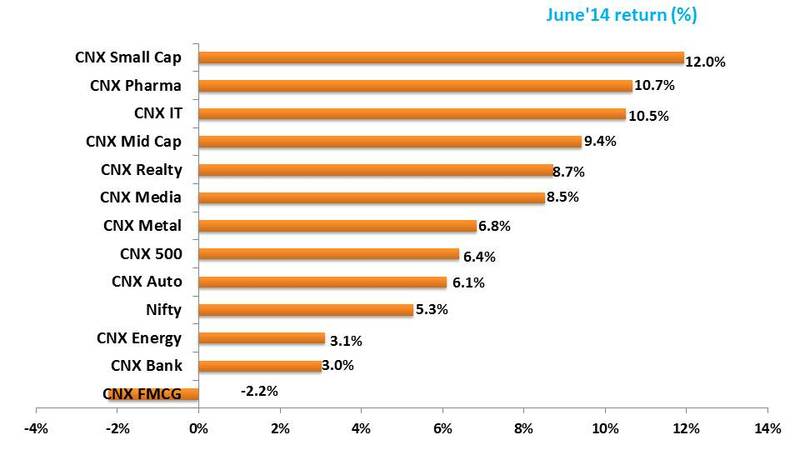 At the same time, other sectors continued its positive run with only exception being FMCG (-2.2%). On YTD basis, small cap stocks (+55.7%) are leading the way followed distantly by mid cap stocks (36.8%). In sector terms, Realty (+39.7%), Banking (+33.9%) and Metals (32.7%) are leading the way, while IT (+4.8%) and FMCG (+2.2%) sectors being the worst performer. Having said that, market started trading sideways by end of this month on account of various factors. Firstly, market is awaiting trigger from upcoming Union Budget on 10th July. Secondly, investors appear to be concerned about a weak monsoon and its fallout on the economic activity. Thirdly, worries about the violence in Iraq and its adverse impact on the crude oil price also hit investor’s sentiment. The Government deferred a decision to raise prices of locally produced natural gas for the next three months; shares of RIL and ONGC fell on the news. Shares of sugar refiners gained after the Union Food Minister said that India would raise import duty on sugar to 40% from 15%. ITC shares slumped on a media report that the Government may raise taxes on cigarettes aggressively in the upcoming budget. Shares of Ranbaxy Laboratories rose after the company received approval from the US Food & Drug Administration (USFDA) to launch a cheaper copy of Novartis AG’s blood pressure pill Diovan. India’s WPI inflation stood at 6.01% in May vs consensus estimate of 5.3%. This is the highest level since December 2013. Also, the March WPI figure was revised to 6% from 5.7% earlier. SEBI announced a slew of measures to boost primary markets, including a proposal to hike public holding in all PSUs to a minimum 25% besides new norms for research analysts and ESOPs. Data showed that India’s manufacturing sector activity expanded at a slightly faster pace in May while the service sector activity returned to the expansion territory after a long time. RBI left the repo rate and the CRR unchanged and tempered its previous hawkish tone on inflation. At the same time, the central bank lowered the SLR rate by 50 bps, slashed liquidity under export refinance facility and introduced a special term repo window. Brent crude surpassed $115 a barrel for the first time since Sept. 2013, driven by continued worries over Iraq. Violence in Iraq has put growth of OPEC crude oil production capacity over the next five years at risk, according to the International Energy Agency (IEA). However, reports suggested that Iraqi oil exports were near record this month, unaffected by the internal turmoil. Separately, OPEC said that it was ready to pump extra oil in the event of any supply disruptions from Iraq. Revised government data showed that the US economy shrank by 2.9% annual pace in 1Q 2014 instead of 1% fall previously reported, marking the biggest decline since early 2009. Federal Reserve Chairwoman Janet Yellen signaled that she was in no hurry to raise interest rates. The World Bank cut global growth forecast for 2014 to 2.8% from 3.2% predicted in January as the harsh winter in the US and a conflict between Russian and Ukraine dragged growth in the US and Europe during the first quarter. The World Bank also warned of a “hard landing” in China that could weigh down East Asian countries and hurt commodity exporters. Moving half way though this year, the Indian equity market has performed pretty well so far taking it among top performing equity markets in the world. FII flows have been robust and the mutual funds are also showing some traction off late. The upcoming Union Budget would be the biggest catalyst in July. Global geopolitical tensions are a cause of concern in the near term.